A group of researchers, Anna Puiggalí-Jou, Luis J. del Valle and Maria M. Pérez-Madrigal, headed by Prof. Carlos Alemán from Universitat Politècnica de Catalunya have just published their results with microcantilevers sensors. The paper “Weighing biointeractions between fibrin (ogen) and clot-binding peptides using microcantilever sensors” published in Journal of Peptide Science examines the biorecognition event between clotted plasma proteins and a tumor-homing pentapeptide, CR(NMe)EKA, by applying a sensing technology based on microcantilevers. The results derived from the different characterization techniques including resonance frequency measurements performed by Mecwins technology (SCALA), reflect the importance of developing emerging technologies suitable for specific medical purposes. Proup of our promoter Montse Calleja. One more year, she is one of the 500 more influential women in Spain according to the magazine YoDona. Watch our 8th anniversary video! Mecwins is participating in the next NanoBio&Med2016 to be held in November 22-24th in Barcelona (Spain). Our colleague Dr. Virginia Cebrian from Bioscience Department will be one of the speakers, introducing latest news and innovations of Mecwins technology at the Industrial Forum. 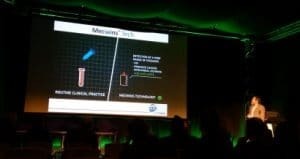 The NanoBio&Med conference is a perfect place to present the most recent international developments in the field of Nanobiotechnology and Nanomedicine. As organizers claim in the website of the conference “the discussion in recent advances, difficulties and breakthroughs will be at his higher level”. It will be our second year participating in the event so we can confirm such assertion. It has been granted a patent which is being developed at Bionanomechanics Lab from IMM-CSIC (In stituto de Microelectrónica de Madrid) by the research group led by Dr. Javier Tamayo and Dr. Montse Calleja. 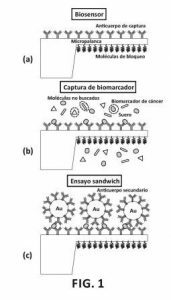 The invention relates to a System for biodetection applications, which comprises two basic elements, a substrate having a functionalised surface, and a nanoparticle, and which can strengthen the plasmonic effect of the nanoparticle. The invention also relates to a bio-sensor that includes said system, and to the method for detecting and quantifying a target analyte selected in a sample using said system. The invention further relates to a device that can detect the strengthened opto-plasmonic effect of the nanoparticles using the system according to the invention, or combine the detection of said opto-plasmonic effect with the analysis of the changes in the mechanical characteristics of the substrate. Mecwins in collaboration with Bionanomechanics Lab from IMM-CSIC (Instituto de Microelectrónica de Madrid) and Advanced Photonic and Biofunctional Materials Group from UAM (Universidad Autónoma de Madrid) will develop a project to develop ultrasensitive technology for the POC diagnosis of prostate cancer. This project, called “NANO-PROST”, will get more than 700K EUR financial aid from the Ministry of Economy and Competitiveness under the “RETOS” program for the period 2016-2018. Mecwins is participating in the next 8th International Meeting on Biotechnology (Biospain 2016) to be held in September 28th – 30th in Bilbao (Spain). Mecwins will attend this conference along with other companies participated in the CRB Bio II Fund managed by our investor CRB Inverbío, silver sponsor at this conference. BIOSPAIN is the largest biotech event organized by a national bioindustry association in Europe and one of the largest in the world by the number of one-to-one meetings (+3.300) and companies participating (+850). 34% of our delegates came from outside of Spain. BIOSPAIN is organized by ASEBIO, the Spanish Bioindustry Association and each edition is co-organized by a local institution from the host city/region. On the 2016 edition, Biospain is co-organized by the Basque Government through the SPRI, the Basque Business Development Agency. Chinese Physical Society Fall Meeting (CPS Fall Meeting) is an annual conference hosted by the Chinese Physical Society, the meeting aims to bring the work of physicists in various fields, exchange of cutting-edge research in physics and academic progress results, and mutual understanding and exchange opportunities for them. Chinese Physical Society 2016 Fall Meeting hosted by the Beijing University of Technology, was held from 1st to 4th of September in Beijing University of Technology. 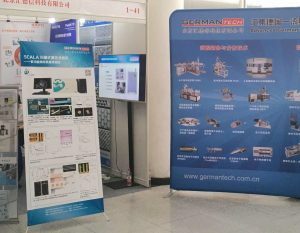 After more than ten years of efforts, the autumn session by the progressive development of the initial size of 200 to the current size of more than 2,500 people, has become a national academic conference in the physical world. Our chinese representative GermanTech was participating in this event and gave to Mecwins the opportunity of being there presenting our SCALA Bio platform. 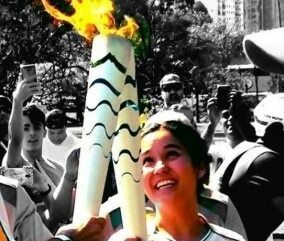 Our scientific advisor Dr. Priscila Kosaka has been chosen among recognized Brasilian scientists to carry the Olympic torch in Rio 2016. As the leading event for laboratory medicine worldwide, the 68th AACC Annual Scientific Meeting & Clinical Lab Expo is the place where breakthrough innovations in clinical testing and patient care are introduced to the healthcare world. Dr. Oscar Ahumada and Rosalía Calleja will fly to Philadelphia on August to attend this event which for sure will provide them with an opportunity to learn about cutting edge diagnostic technology and connect with global experts in clinical chemistry, molecular diagnostics, mass spectrometry, translational medicine, lab management, and other areas of breaking science in laboratory medicine. Further information about his event by clicking here.